The hotel is composed of a building reminiscent of Majorcan stately homes, built on four floors, in the form of a "U". It has a total of 210 rooms, recently renovated, and equipped with all that is necessary for the best holiday. 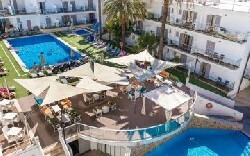 The EIX Alcudia Hotel wants all its guests to have an unforgettable holiday, so it provides the best facilities and services like an inner courtyard surrounded by palm trees where you will find the swimming pool with sun loungers and parasols, a covered chill-out terrace… and everything indispensable for our guests to have a comfortable and easy-going holiday. Enjoy the best holidays in Alcudia!